What Are the Health Benefits of Haddock? Like its close relative, cod, the whitefish haddock hails from the cold waters of the North Atlantic Ocean. Sometimes sold under the name scrod, haddock enjoys a slightly sweeter taste and finer texture than cod, but the two are often swapped in recipes. 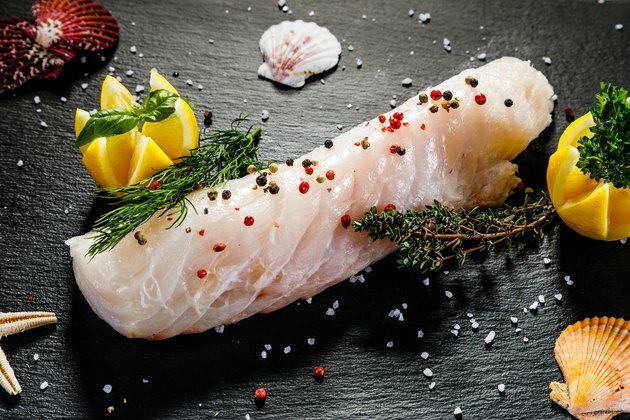 Haddock rates among the best fish to eat because of its high-protein, low-calorie and low-mercury content, but it ranks lower than many other fish for its heart-healthy fats. The health benefits of haddock include: very low in calories (77 calories per 3 ounces), high in protein (17 grams per 3 ounces) and an excellent source of selenium, phosphorus and some of the B vitamins. The American Heart Association recommends 3 ounces as the serving size for cooked fish. To visualize 3 ounces, think of the size of the palm of your hand. In 3 ounces of cooked haddock, you'll get just 77 calories, making it a very low-calorie choice for protein. A similar serving of smoked haddock contains slightly more, with 99 calories. By comparison, a serving of a fatty fish like cooked sockeye salmon comes in at 133 calories. A serving of cooked haddock supplies 17 grams of protein, or 34 percent of the daily value if you follow a 2,000-calorie diet. Smoked haddock supplies even more, with 21 grams in 3 ounces — only slightly less than salmon, which has 23 grams. Your body needs adequate protein to build muscle and tissue. Most animal sources of this nutrient, however, are also high in saturated fat — the type of fat associated with a higher risk of heart disease. Like other fish, cooked and smoked salmon supply only a trace of saturated fat, making them a heart-healthy choice for your meals and a good substitute for red meat. Both types of haddock contain dietary cholesterol, with cooked haddock giving you 19 percent of the daily value and smoked haddock, 22 percent. The Dietary Guidelines for Americans, however, warns that saturated fat has a greater link to heart disease than dietary cholesterol. The guide no longer places a strict limit on the amount of cholesterol Americans should get daily from food, but it does suggest staying under 300 milligrams. The fat in fish comes primarily from polyunsaturated fats called omega-3 fatty acids. All fin fish and shellfish contain some omega-3s, but fattier fish like salmon, herring and mackerel supply the richest amounts of it — over 1,500 milligrams in a serving. Omega-3s famously support heart health. In addition, these polyunsaturated fats — particularly the omega-3 known as docosahexaenoic acid (DHA) — boost the health of your brain too. DHA helps the brain function normally, and lower blood levels of this fatty acid have links to depression and cognitive issues like Alzheimer's. Omega-3s may also have benefits for skin health, preventing conditions like dermatitis. While haddock does supply omega-3s, it falls at the lower end of the scale for these beneficial fats, providing less than 200 milligrams in a 3-ounce cooked serving. While there's no daily value for omega-3 fatty acids, the adequate intake — the amount needed for satisfactory nutrition — is 1,100 milligrams a day for women and 1,600 milligrams for men of combined DHA and EPA, or eicosapentaenoic acid. Although it has distinct health benefits, fish consumption also comes with a unique drawback. According to the Food and Drug Administration (FDA), almost all fish and shellfish carry traces of mercury, a heavy metal that accumulates in bodies of water. When humans ingest fish containing the metal, they may experience neurological, digestive and immune disorders. Especially at risk for mercury poisoning are small children, whose brains and nervous systems are still developing, and pregnant women, who can transfer it to their fetuses. The problem of mercury contamination is most serious among large fish, like swordfish, shark, tilefish and orange roughy, which live longer and feed on smaller fish. While you should avoid these larger fish in the diet, you can safely enjoy haddock and other whitefish two to three times a week, according to the FDA. A serving of cooked haddock supplies a mix of minerals, most in small amounts. Haddock's phosphorus and selenium content, however, is notable. In 3 ounces of cooked haddock, you'll get 19 percent of the daily value for phosphorus and 49 percent for selenium. Phosphorus builds healthy bones and teeth. Selenium is an antioxidant mineral that helps combat free radicals — rogue molecules that can damage your DNA and lead to chronic diseases like cancer. Smoked haddock gives you excellent amounts of these two minerals as well. A serving provides 17 percent of the daily value for phosphorus, and 66 percent of your selenium needs. Smoking, however, also increases haddock's content of the mineral sodium, because the process involves salting the fish. While cooked haddock contains only 222 milligrams of sodium, smoked haddock provides three times that amount. Sodium occurs naturally in foods like haddock, but the addition of too much salt to prepared foods liked smoked haddock can cause health problems. Healthy individuals should limit their sodium intake to 2,300 milligrams a day, while those with high blood pressure and heart disease should stop at 1,500 milligrams. Americans on average, though, get about 3,400 milligrams a day, according to a 2014 article in Today's Dietitian. Excess sodium can put a strain on your kidneys' ability to excrete it, leading to a buildup in the bloodstream. That, in turn, can result in a hardening of the body's arteries and an increased risk of hypertension, heart attack and stroke. Choose regular cooked haddock more often than smoked to avoid excess sodium intake. A serving of haddock is rich in several B vitamins, a family of water-soluble nutrients you must get from your diet. Most notable in haddock are niacin, or B3, and vitamins B6 and B12. Niacin plays a role in metabolizing the carbohydrates and fat you eat into energy your body can use for fuel. B3 is also important to nerve and digestive health. In addition to metabolizing protein and carbs, vitamin B6, or pyridoxine, helps form red blood cells and supports brain health. Vitamin B12 has direct links to nerve health and cognition. A study published in the journal Movement Disorders in 2018 found a connection between low vitamin B12 levels and worsening mobility among patients with early Parkinson's disease symptoms. You'll get 22 percent of the daily value for niacin in a serving of cooked haddock, and 27 percent in smoked haddock. A serving of cooked haddock supplies 16 percent of your needs for vitamin B6 and 75 percent of the daily value for B12. Three ounces of smoked haddock gives you 20 percent of the daily value for B6 and 57 percent of B12. In addition to the health benefits of haddock, this mild fish tastes delicious and lends itself to a variety of cooking methods and dishes. Although haddock is too flaky in texture to hold up on the grill, other healthy preparation methods include broiling, baking, poaching and light sautéing or stir-frying. Deep-frying your haddock will add fat and calories to an otherwise nutritious fish. You can buy haddock fresh or frozen. To prevent food poisoning, make sure the market displays its fresh seafood in a bed of crushed ice. Avoid fresh haddock that smells "fishy" or sour. If the haddock is labeled as "previously frozen," its smell should still be mild and not overpowering. Keep fish cold in transit to your home, where you should refrigerate it again. Frozen fish packages may have thawed in transport to the store. Packages that have formed ice crystals have been stored too long, or they may have thawed and been frozen again. Check the packaging, too, for tears. The haddock should be completely firm, not pliable. To thaw frozen fish before eating, keep it in the refrigerator overnight. For baking or broiling, haddock pairs well with garlic and lemon. Serve it on a leafy green salad for a hearty lunch or with wild rice and broccoli for dinner. Brits use haddock for their tasty fish and chips, but the traditional dish is loaded with fat and calories. For a healthier, mock version of fish and chips, brush haddock fillets with a little olive oil, coat in panko breadcrumbs, sprinkle with herbs and bake. Serve with "fries" made from sliced and baked sweet or russet potatoes. Like cod, haddock works well in fish chowder or stew. Chowders tend to be milk- or cream-based, but fish stews usually start with tomatoes. Get creative with your stew by experimenting with different flavor combinations for a Mediterranean-, East African- or Moroccan-style dish. For Tex-Mex night at your house, use haddock in place of ground beef to create fish tacos that are lower in calories and fat. Cut the haddock fillets into bite-sized pieces; marinate in olive oil, chili powder, lime and cilantro; then broil. Fill flour or corn tortillas with the fish, then top with a slaw made from shredded fresh veggies, plain yogurt, jalapeno pepper and lime juice. A small percentage of people may develop an allergy to whitefish, such as haddock. Unlike other food intolerances that appear in childhood, a fish allergy may not show up until you're an adult, says the American College of Allergy, Asthma and Immunology. Symptoms of a fish allergy may include hives, sneezing, headaches, respiratory problems and, in extreme cases, anaphylaxis. If you experience symptoms and think you're allergic, the best treatment is to avoid eating fish and fish products.